A simple Beef Salpicao recipe I got from this site. Beef Salpicao is understandably another Filipino restaurant favorite. Tender beef with a hint of sauce and garlic goes well with rice. I got a thumbs-up from the husband for this one. 1. In a shallow bowl, combine beef, garlic, salt, pepper.Mix well and let it stand for 10 minutes. I used beef strips because it cooks easily. I also used store-bought minced garlic. It would've been more "garlicky" if I chopped fresh garlic so I added 1 tbsp. minced garlic later before the oyster sauce was added. 2. Mix in the oil and marinate for 30 minutes. 3. On a very hot pan (high-heat), put in the mixed ingredients. 4. 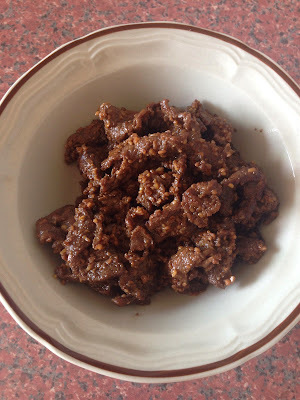 Stir constantly until the beef is evenly cooked and browned. 5. Add in the oyster sauce and worcestershire sauce and continue stirring until it dries up. 6. Add the butter and continue cooking for about 3 minutes. 7. Remove from heat and serve hot with rice.